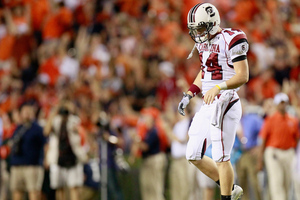 After a few days of intense speculations among Carolina fans, Steve Spurrier has announced that Connor Shaw is going to start in this weekend's key contest against Missouri instead of Dylan Thompson. While some fans seem most comfortable with Shaw, most of us are probably questioning this decision. Let's take a close look at things and see if we can decide what the best plan of action really is. --The main benefit of starting Shaw is that he's a proven winner in the SEC. Going back to last season, the only SEC contest Shaw has lost came against a top 10 Arkansas team. (It feels like so long ago when we could call Arkansas that. I guess it was only two weeks ago, though.) Shaw also played extremely well in key games against Clemson and Nebraska. I don't think that there's any question that the coaching staff has thought that Shaw--or, at least, a healthy Shaw--is a significantly better option at QB than Thompson. The staff has a lot of confidence that Shaw--again, healthy Shaw--should be our guy and that he gives us the best chance to win football games. And there's always the possibility that Shaw isn't as limited as some of us think he is. For one thing, he seemed to be settling into a rhythm late in first half against UAB. Moreover, Spurrier has said that they didn't really have to take him out of the game, but that they felt like they should because we were setting up to have a nice second-half lead by the time he got hit. Keep your fingers crossed, folks. --Even granting that Shaw may be limited right now, it's almost certainly worth stepping back from the Thompson-ade until Thompson has proven that he can play at a high level against a talented SEC opponent. Thompson has looked good throwing the long ball against subpar competition, but that's about all we really know about him right now. Well, there is one other thing we know about him: He's a very rhythmic, sink-or-swim QB. Against Vandy, he couldn't buy a completion. Early on against UAB, he had the same problem. In fact, he was lucky he didn't get yanked from the contest, because he threw a couple of passes that should have been interceptions, and Spurrier had Seth Strickland warming up at that point. Fortunately for Thompson, he completed a nice pass to Bruce Ellington after those early mistakes, and the rest is history. But I'm concerned about what could happen if, particularly when he has his first experience of pressure from an SEC defensive lineman, Thompson begins making mistakes and gets shellshocked. That seems like a real possibility with him, and, due to turnovers, we could find ourselves in a deep hole really quickly if it happens. With Shaw, on the other hand, we can probably expect a largely mistake-free performance, even if it's not the juggernaut performance we're hoping for. That would allow our defense to win games for us, or at least we could hope. --If Shaw is healthy enough to run, he's what we need to jump start our running game. The personnel we have on this team, including our star tailback, is designed to be most effective while running the zone-read. Shaw presents a running threat from that look that will open up the rest of that aspect of the offense. If we can get this part of our offense going, we'll be very dangerous, as a good running game is always a hot commodity in the SEC. That said, this is all assuming that Shaw feels up to running the ball frequently. Spurrier says that Shaw is, and although Shaw didn't look like it against UAB, that may have just been because the staff didn't want to risk Shaw's health in a game of little consequence. We'll see, though. The principal con here is that just about everything positive that you can say about Shaw relies on the assumption that he's healthy, and that seems unlikely. An unhealthy Shaw has less zip on his throws, is hesitant and doesn't trust his arm, and is afraid to put himself in harms way as a runner. He's a shell of his former self. We can hope the staff is playing coy and that Shaw is in better shape than they're leading on, but so far, that doesn't appear to be the case. Even going back to before he hurt his shoulder blade, he hasn't looked comfortable yet this year. Moreover, while I'm not sure that Thompson is a better option than a hurt Shaw, there's a good bit of recent evidence that suggests that he is. If Shaw is healthy, then I think this is the right decision. If he's not, which seems likely at this point, then I sure hope Shaw has a short leash in this game. Thompson may be an unproven quantity at this point, but if Shaw can't get the job done, don't you at least have to give Thompson a chance to show us whether or not he has what it takes in this game? Indeed, I'd probably most prefer to see us give Thompson the start so he gets that chance out of the gate, with Shaw available to come in and stabilize things if Thompson throws an early pick or two. Sounds like that's wishful thinking, though. A really very nice article with a nice sum of information and explanation of the occasion i liked reading it . thanks for sharing..